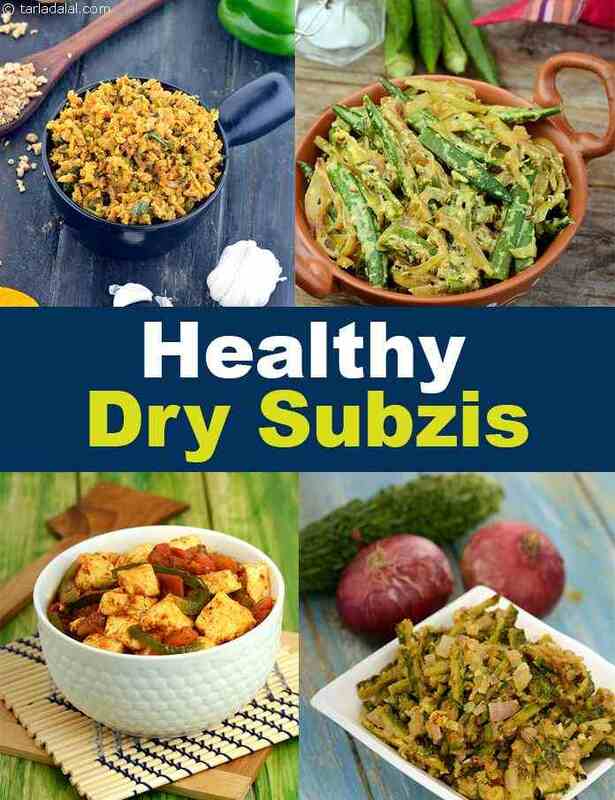 healthy dry subzis. veg dry healthy indain vegetables. Dry Subzis form a part of our daily meals at least 4 to 5 times a week. However the word ‘dry’ is associated with ‘no gravy’ and actually the subzi is cooked in oodles of oil. This section is a compilation of recipes using minimal oil or they are absolutely zero oil. 1. Stir fry the vegetables instead of deep frying in recipes like Bhindi Masala. 2. Add only 1 teaspoon oil or less per person in the subzi. 3. Instead of adding extra oil for sautéing add water to cook. 4. Boil or steam the vegetables so that less oil is required to cook them. Quick Paneer Subzi has the goodness of paneer in it which is calcium rich. A healthy green vegetable to try is French Beans Chana Dal Stir Fry which is great for Diabetics as the fibre present in the French Beans binds the glucose and slows down its absorbtion preventing a rise in blood sugar levels. A wide variety of vegetables have been used to create delicacies like Masala Cauliflower with Green Peas, Methi Moong Dal Subzi, Beetroot Subzi . Try Pyazwala Bhindi made with low fat curds which is good for heart patients. Learn the art of cooking healthy and tasty subzis here and get ready to draw in a variety of nutrients as well. Try these dry subzis as a daily fare with hot phulkas!! Enjoy our collection of Healthy Dry Subzi recipes and Healthy Subzi articles below.